1. Make your own spices: Spices can be really expensive, and will you really use “Pumpkin Pie Spice” throughout the year? Doubt it. Google a make-it-yourself poultry seasoning recipe to save a few bucks using ingredients you likely already have in the pantry. 3. Cook from scratch: Obviously bottled gravy, powdered potatoes and pre-made pies come with more convenience, but they also come with a higher price tag. 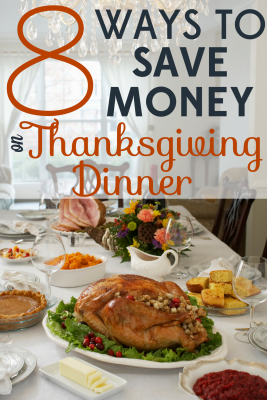 Plan ahead to spend a bit more time in the kitchen making stuffing and dinner rolls, and you could cut your expenses in half. 4. Throw a potluck: No one says you have to do all the spending or work. Send out email invitations to your guests, asking them to bring a bottle of wine, dish or dessert to pass and share in the cost and the cooking. 7. Use a meal calculator: You are expecting ten guests, so should you multiply your recipes by 5? 8? 10? One quick way to overspend is by making too much food. 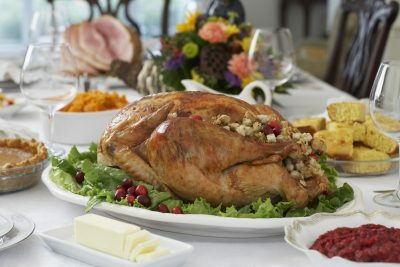 Use this Thanksgiving Calculator to figure how much of each ingredient you really need. Trust me, you will STILL have leftovers!